You can use the Azure CLI to create and manage Azure resources from the command line or in scripts. This quickstart describes how to use the Azure CLI to create an Azure Database for MariaDB server in an Azure resource group in about five minutes. If you install and use the CLI locally, for this quickstart, you must run Azure CLI version 2.0 or later. Run az --version to find the version. If you need to install or upgrade the CLI, see Install Azure CLI 2.0. Create an Azure resource group by using the az group create command. A resource group is a logical container in which Azure resources are deployed and managed as a group. Create an Azure Database for MariaDB server by using the az mariadb server create command. A server can manage multiple databases. Typically, a separate database is used for each project or for each user. name mydemoserver Enter a unique name that identifies your Azure Database for MariaDB server. The server name can contain only lowercase letters, numbers, and the hyphen (-) character. It must contain between 3 and 63 characters. resource-group myresourcegroup Enter the name of the Azure resource group. sku-name GP_Gen5_2 The name of the SKU. Follows the convention pricing tier_compute generation_vCores in shorthand. For more information about the sku-name parameter, see the section after this table. backup-retention 7 How long a backup should be retained. The unit is days. Range: 7 to 35.
geo-redundant-backup Disabled Whether geo-redundant backups should be enabled for this server. Allowed values: Enabled, Disabled. location westus The Azure location for the server. ssl-enforcement Enabled Whether SSL should be enabled for this server. Allowed values: Enabled, Disabled. storage-size 51200 The storage capacity of the server (the unit is megabytes). Valid storage sizes are 5,120 MB (minimum) with increases in 1,024-MB increments. For more information about storage size limits, see Pricing tiers. version 10.2 The MariaDB major engine version. admin-user myadmin The user name for the administrator login. The admin-user parameter can't be azure_superuser, admin, administrator, root, guest, or public. admin-password your password The password of the administrator user. Your password must contain between 8 and 128 characters. It must contain characters from three of the following categories: English uppercase letters, English lowercase letters, numbers, and non-alphanumeric characters. --sku-name B_Gen5_1 maps to Basic, Gen 5, and 1 vCore. This option is the smallest SKU available. --sku-name GP_Gen5_32 maps to General Purpose, Gen 5, and 32 vCores. --sku-name MO_Gen5_2 maps to Memory Optimized, Gen 5, and 2 vCores. For information about valid values by region and for tiers, see Pricing tiers. The following example creates a server named mydemoserver in the West US region. The server is in the resource group myresourcegroup and has the server admin login myadmin. The server is a Gen 5 server in the General Purpose pricing tier and it has 2 vCores. A server name maps to a DNS name and must be globally unique in Azure. Substitute <server_admin_password> with your own server admin password. Create an Azure Database for MariaDB server-level firewall rule by using the az mariadb server firewall-rule create command. A server-level firewall rule allows an external application like the mysql command-line tool or MySQL Workbench to connect to your server through the Azure Database for MariaDB service firewall. The following example creates a firewall rule called AllowMyIP that allows connections from a specific IP address, 192.168.0.1. Substitute an IP address or range of IP addresses that corresponds to the location you connect from. 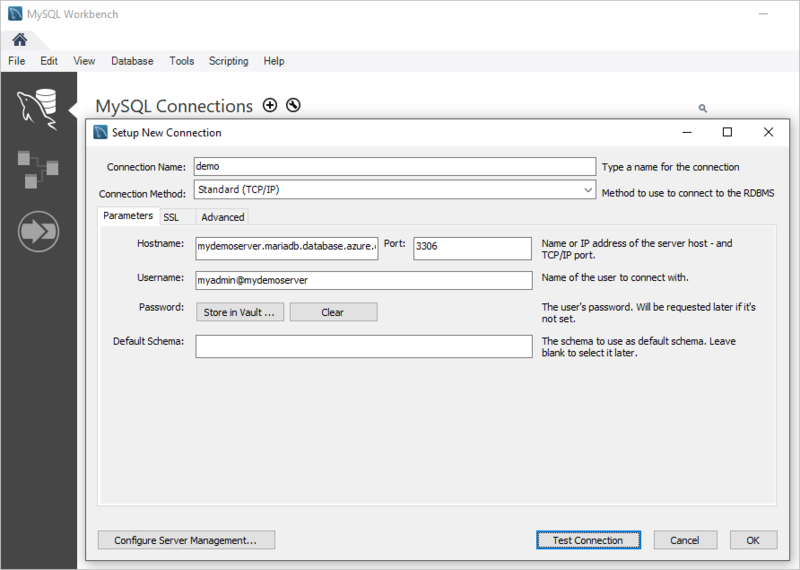 Connections to Azure Database for MariaDB communicate over port 3306. If you try to connect from inside a corporate network, outbound traffic over port 3306 might not be allowed. In this case, you can connect to your server only if your IT department opens port 3306. By default, SSL connections between your server and client applications are enforced. This default setting ensures security of "in-motion" data by encrypting the data stream over the internet. For this quickstart, disable SSL connections for your server. Disabling SSL is not recommended for production servers. For more information, see Configure SSL connectivity in your application to securely connect to Azure Database for MariaDB. The result is in JSON format. Make a note of the values for fullyQualifiedDomainName and administratorLogin. Connect to your server by using the mysql command-line tool. You can download the command-line tool and install it on your computer. You can also access the command-line tool by selecting the Try It button on a code sample in this article. Another way to access the command-line tool is to select the >_ button on the upper-right toolbar in the Azure portal to open Azure Cloud Shell. For additional commands, see MySQL 5.7 Reference Manual - Chapter 4.5.1. Open MySQL Workbench on your client computer. If it's not already installed, download and install the application. Hostname mydemoserver.mariadb.database.azure.com The server name that you noted earlier. Port 3306 The default port for Azure Database for MariaDB. Username myadmin@mydemoserver The server admin login that you noted earlier. Password your password Use the admin account password that you set up earlier. To check whether all parameters are configured correctly, select Test Connection. Select the connection to successfully connect to the server.